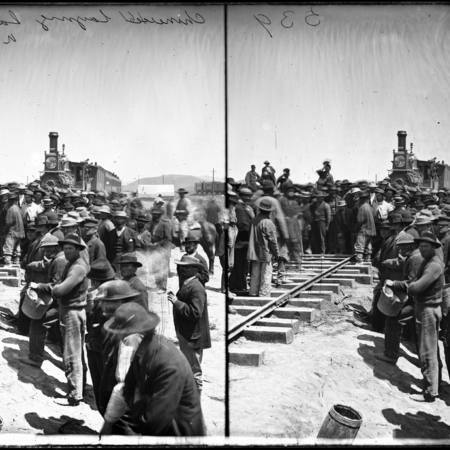 "Breaking Ground for the Utah Central Railroad"
Stereoview photograph no. 150 by A.J. Russell captioned "Mormons Breaking Ground for Utah Central Railroad." Photo features a large group of people waiting for the groundbreaking ceremony. Stereoview photograph by A.J. Russell. 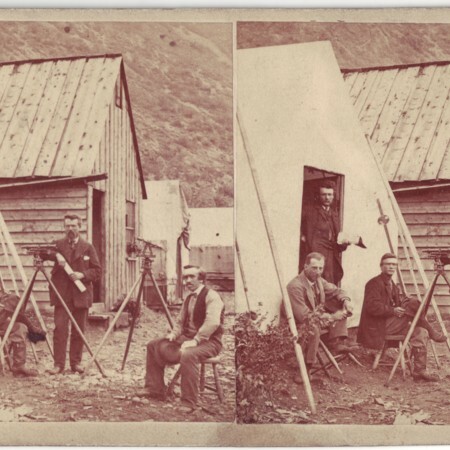 Photograph features a group of railroad surveyors with their equipment in a camp in Weber Canyon in 1868. Photograph of a photography cart taken by A.J. Russell in the desert. 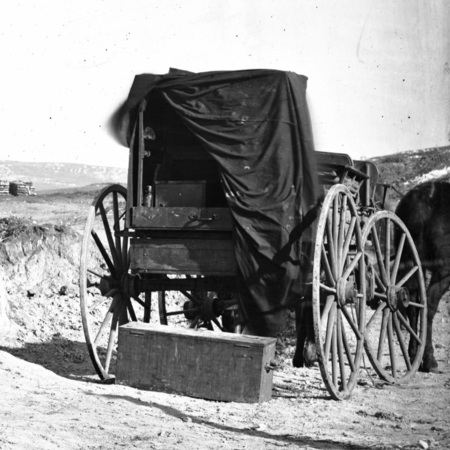 The cart is pulled by a horse and is functioning as a mobile darkroom. 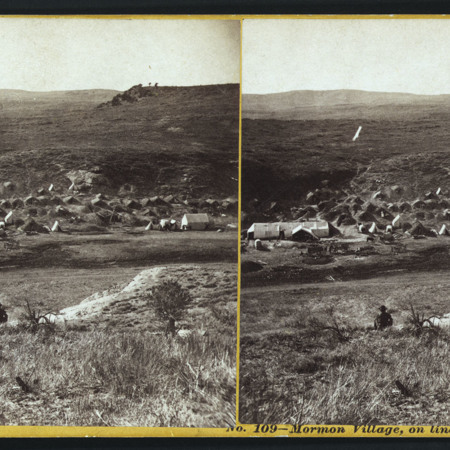 Stereoview photograph #168 by A.J. Russell. The photograph features another photographer with his equipment against the background of a settlement with several other people. "West End Tunnel, No. 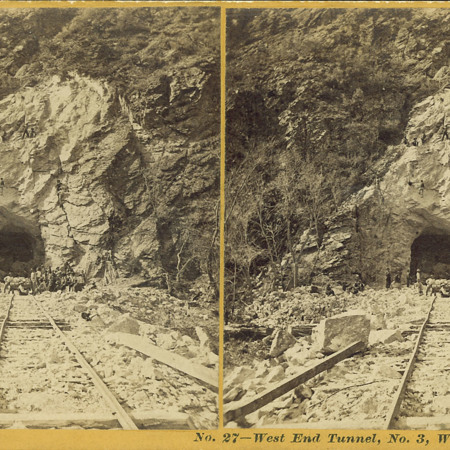 3, Weber Canyon"
Stereoview photograph entitled "West End Tunnel, No. 3, Weber Canon. (sic)" Photograph features a crew of railroad workers standing in front of a tunnel dug through Weber Canyon in Utah. Some of the workers are dangling from the cliffs above. 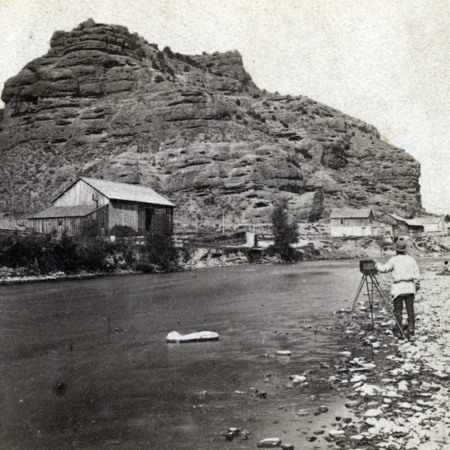 A photograph of a photographer standing with a tripod on the banks of a river with a town in the background. 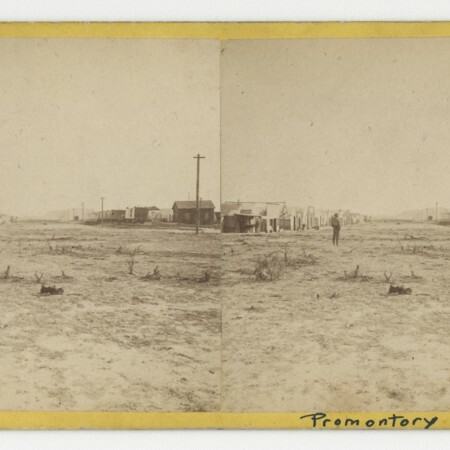 Stereoview photograph #109 by A.J. 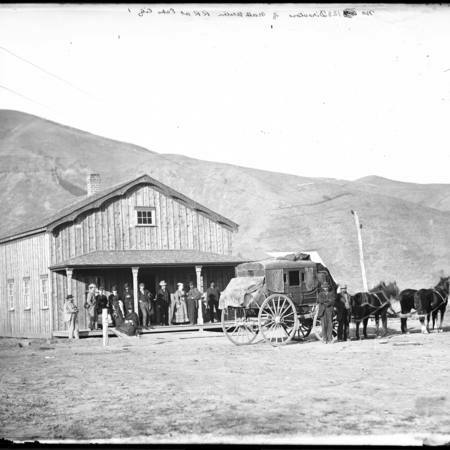 Russell captioned "Mormon Village, on line of Railroad, Echo Canyon." 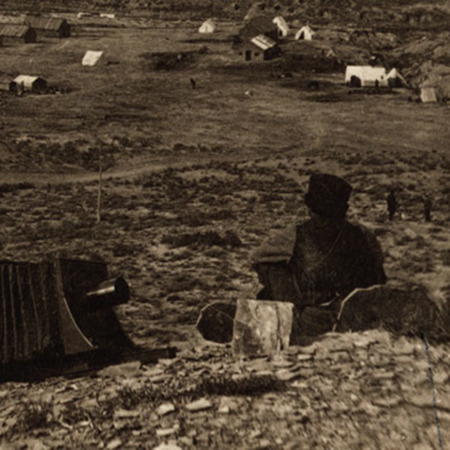 Photograph features a man sitting on a hill overlooking a Mormon settlement in Northern Utah. Stereoview photograph taken by A.J. Russell for the Union Pacific's Railroad Views collection. Photograph is entitled, "Devil's Gate Bridge" and features a train with a car full of men crossing the bridge. Stereoview photograph by A.J. Russell entitled "Promontory Utah." Features one man in an otherwise empty frontier town. 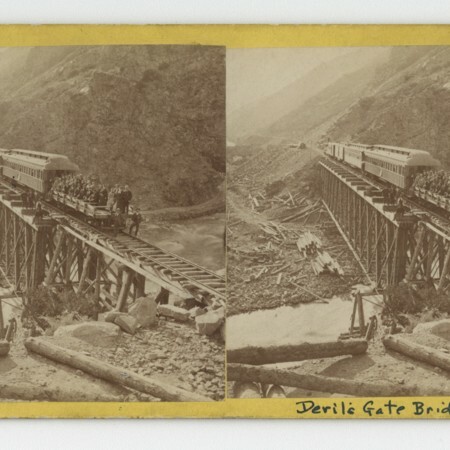 This stereoview was part of the Union Pacific Rail Road Views collection. "Directors of the North Western RR at Echo City"
Originally a stereoview photograph by A.J. Russell, number 91. Title: "Photographing Under Difficulties." 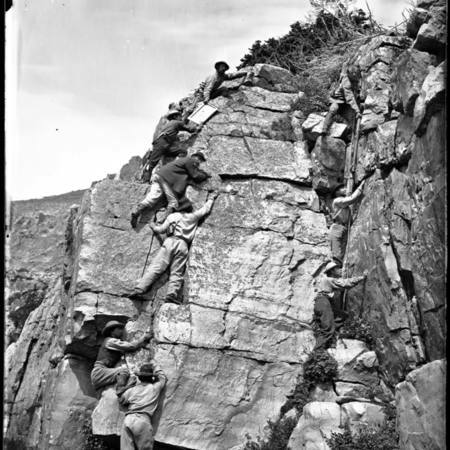 This photograph depicts the Clarence King surveying party in the Uintah mountains, climbing a steep cliff with all of their equipment. "Looking up the Weber From the Top of Tunnel No. 4"
Originally a stereoview photograph by A.J. Russell entitled "Looking up the Weber." Numbered as 194. 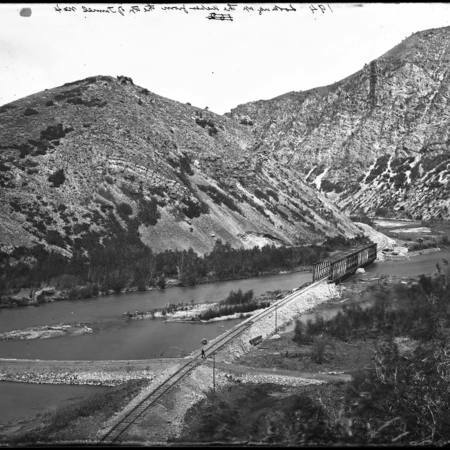 Photograph features a railroad bridge before the entrance of Weber Canyon and a man walking along the tracks. 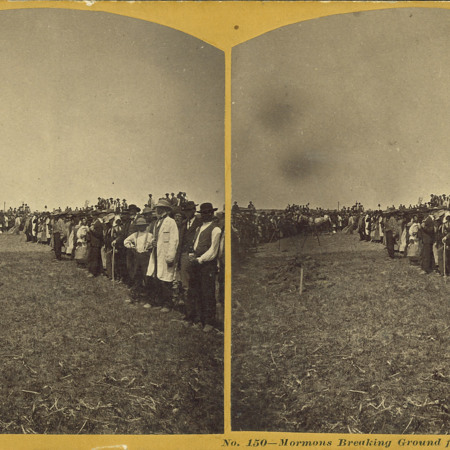 Stereoview photograph #372 by A.J. Russell. 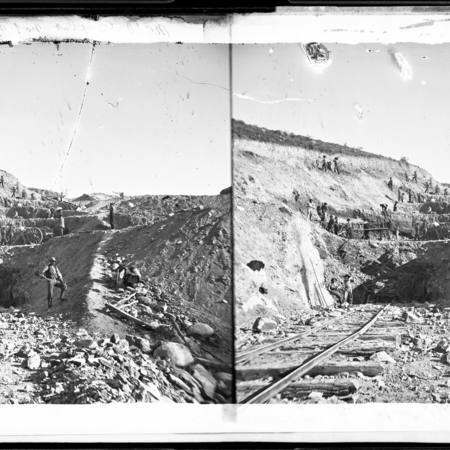 The photograph features a group of (probably Mormon) men working on a cut in Weber Canyon. "East and West Shaking Hands"
Large-format print entitled "East and West Shaking Hands." 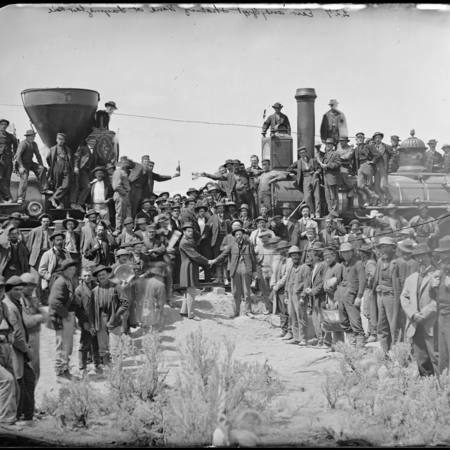 The photograph features the two trains of the Union and Central Pacific lines meeting at Promontory Point with executives and crew members from both lines. Large-format print no. 513 by A.J. Russell entitled Paymaster's Car, Blue Creek." 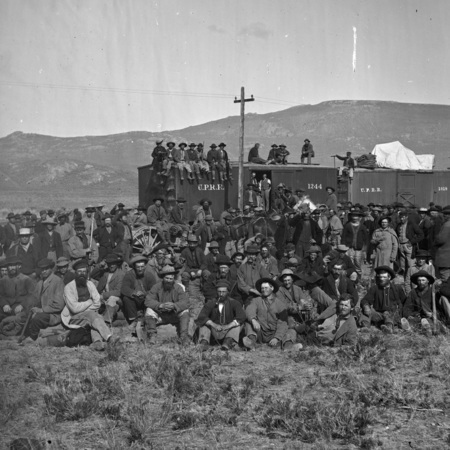 The photograph features a crew of railroad workers sitting around and on the paymaster's train car, telegraph wires, and a backdrop of the mountains. "Warner and Whitman's at Echo"
Large-format print no. 125 by A.J. Russell entitled "Warner and Whitman's at Echo." 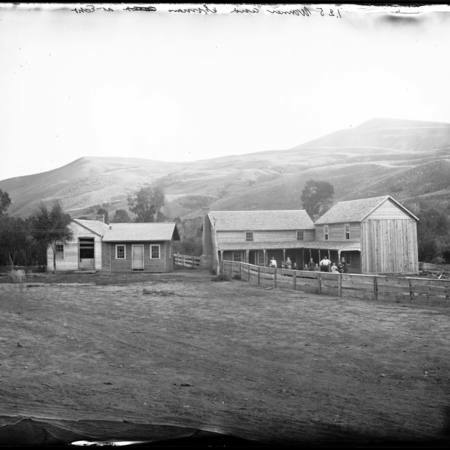 The photograph features two families standing near a farmhouse on a farm in rural Utah.